Dollar coins just don’t circulate that much in the USA. And they’re irritating when you receive a handful as change from the mass transit ticket machine. You must carry a heavy and bulky mass in your pocket or purse on your trip. We’ve all seen the recent news about the US Mint having to store a surplus of 1.4 billion (that’s a “b” for billion) presidential dollar coins. But, this isn’t the first time the US Mint became stuck with extra dollar coins in the modern production of the coins —many years after the circulating 90% silver dollar coins. Back in 1971, the US Mint produced the Eisenhower dollar, their first dollar coin since 1935. Initially, people were interested in the new dollar coins. Many people “liked Ike” and wanted a coin with his image. Others celebrated the “return of the cartwheel,” a name used for the older silver dollar coins of the same size. The coin’s initial popularity also benefited from the collectible 40% silver Eisenhower dollar coins produced at the San Francisco mint. As a result, the Treasury Department considered a new, smaller dollar coin that would primarily be used in vending machines. The coin would be larger than a quarter but smaller than the Kennedy half dollar coin. In hindsight, that’s one of those assumptions that make donkeys out of us. Ouch. As they began their design efforts for the new, smaller dollar coin, the US Mint ran into differing opinions and strong debates about the image for the coin. In the end, the approving body chose the Susan B. Anthony image for the coin’s obverse. Just guessing from reports of the day, the controversial choice of the suffragette contributed to the new dollar coin’s lack of acceptance. First released in 1979, the US Mint initially produced over 700 million of the new, smaller dollar coins for the supposedly pent-up demand. By early 1980, not even a year later, the coin suffered from lack of circulation. Even with all of the initial marketing fanfare to generate interest, people would not use and circulate the coin. Some likened the dollar coin to the quarter – it was too confusing. Others, in gambling establishments, claimed the coin didn’t feel like a $1 and didn’t provide the same resounding “clink” as the larger dollar coins. By February 1980, the US Mint stopped all Susan B. Anthony production. Less than half of the over 700 million coins minted were in circulation. Though some Susan B. Anthony dollar coins do carry the 1980 and 1981 dates, in mid-summer of 1981, the new director-designate of the US Mint told the Senate Banking Committee that no more of the dollar coins would be minted. Only 300 million existed in circulation and the mint stored 500 million. She advised the Banking Committee that no more of the coins were needed especially with a reduction in the US Mint’s budget. On the other hand, these dollar coin failures do not stop various lobbyists, industries and congress from wanting a dollar coin. Moving forward to 1995, the Director of the Mint, Philip N. Diehl, argued against a new dollar coin. Fifteen years after Donna Pope’s comments to the Senate Banking Committee, the mint still stored 300 million of unwanted Susan B. Anthony dollars. But with a push by transit systems and the US Postal Service, the Susan B. Anthony dollar coin supply dwindled to 133 million and was projected to last for 30 months. For the next dollar coin, congress approved a new golden-colored design with a likeness representing Sacagawea on the obverse. The size remained the same such that existing machines would accept the new dollar coins. Before the new golden dollar could debut in 2000, demand in 1999 forced the US Mint to produce more of the previously unwanted Susan B. Anthony dollar coins. The new Sacagawea dollar arrived with the help of Walmart and General Mills. General Mills placed coins in a few of their Cheerios boxes. Walmart agreed to dispense the new dollar coins in change. 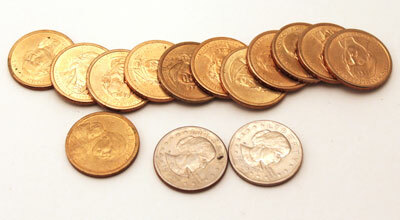 These efforts helped generate interest in the Sacagawea golden dollar. But, once again, the new dollar coins did not circulate that widely. Continuing the drive for a circulating dollar coin in the mid-2000s, Congress approved additional Native American golden dollar reverse designs, a new one to be released each year. Congress also approved a Presidential golden dollar coin. In 2007, the US Mint began producing the Presidential golden dollars honoring former presidents. Each year, four new Presidential dollars arrived for circulation. These new dollar coins included the image of an early president and was released in the order in which they served in office. The US Mint planned the Presidential dollar coin images and releases for 2007 through 2016. But, 2011 marked the halfway point through the program, and the US Mint again faced a storage problem for unwanted dollars – 1.4 billion of them. Required by law to mint the golden dollar coins, nevertheless the US Mint suspended the production of the circulating Presidential dollar coins. Why produce more just to store them? Instead, they will satisfy the legal requirement by producing collectible versions of the Presidential dollar coins. In the meantime, it’s too bad the golden dollar coins can’t be easily melted for their metal value like the silver dollars.